Cable railings have become a popular choice in recent years for completing decks, stairways and other projects in homes, commercial buildings and public spaces. They are easy to install and designed to withstand weather extremes, providing a low-maintenance railing with many benefits. In fact, many buildings that incorporate cable railings through remodeling or retrofitting see an increase in resale value. If you’re looking for an opportunity to install a cable railing, here are the more popular places where they are used. 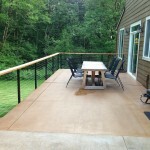 Undoubtedly the most common place to install a cable railing is on a backyard deck. 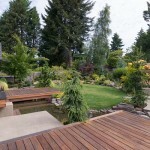 Builders and homeowners know that a deck can be a prized possession, especially in the warm summer months when we all love to barbecue and relax with family and friends outside. In every municipality, building codes require certain precautions to keep occupants safe. This almost always includes a railing. The one thing about adding a railing to a deck, however, is that they tend to block the scenic views — the reason many decks are built in the first place. Cable railings allow for the clearest view, and the least amount of work to maintain it. A balcony is a lot like a deck, but in this case the platform is supported by the structure of the building rather than standing alone as an attachment. Balconies and terraces are usually smaller than a deck, but still deserve a strong, stylish railing. Used for smaller outdoor spaces, a cable railing’s transparent quality can provide a feeling of spaciousness and an optimal view. Stairs are another common place for cable railing. There is almost no instance where a railing isn’t required where there are stairs. A cable railing is an affordable, easy-to-install railing option for staircases and other interior applications. With an inconspicuous yet complementary look, cable railings provide the open feeling so many homeowners desire. Cable railings can easily be incorporated in outdoor spaces to mark pathways and add interest to landscaping. By using a cable railing rather than a wooden fence, you can appreciate the entire outdoor space without obstruction. Also, installing cables in a garden setting will allow climbing plants and other vines to show off and make the railing a part of the landscape. If you have a pool or spa on your property, you’re already aware of the municipal codes requiring you to have a protective fence or railing. Chain-link fences can ruin the aesthetic of your property, and wood fences usually require a great deal of upkeep. Installing a cable railing around your pool will keep your property looking nice, cut down on chores, and keep children safe. This type or guard rail is approved by many building codes as a pool perimeter, although you should always check with your city or county before ordering or installing one.